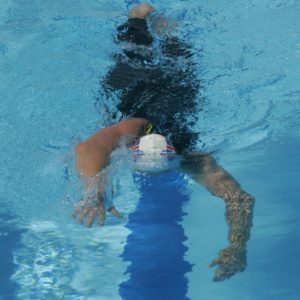 If you have mastered a streamlined body position, added rotation and can keep your head still unless turning to breathe then chances are you are probably swimming pretty well. What might the last area be to focus on? well last Saturday evening for a local charity a group of us swam 100x100m FC. 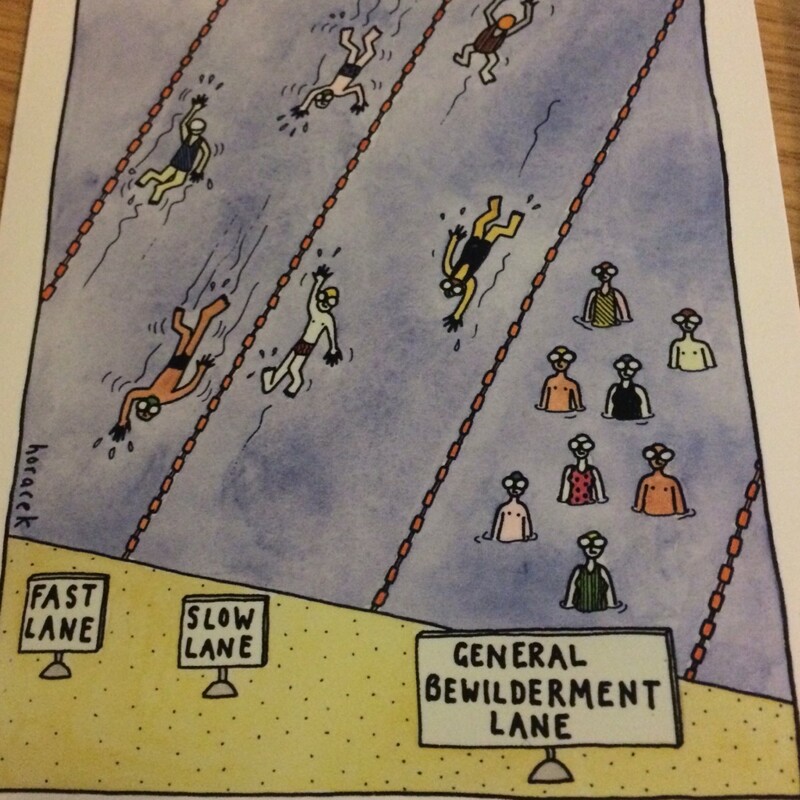 It was interesting that for the most part the faster lanes managed to keep their technique for longer. The group was a mix of former club swimmers, fit and unfit, Triathletes and Openwater swimmers. 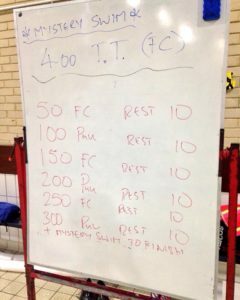 If fit, the former club swimmers held on for the longest but in the end fatigue got to all of us. The main problem was a collapse in how we created our rotation meaning we then leaned on a straight arm pushdown to help us come up for air. As I have said before poor technique due to fatigue is ok, it is inevitable and a byproduct of hard work. It should not be seen as a negative thing. As long as we repair, polish and restore it back to its former glory as soon as possible. If the shoulders are not being lifted as a result of the bodies natural rotation then the act of breathing needs help. Like a simple seesaw. To come up we need to push down. We lean on our arm as it pushes down and this helps us come up for air. What it does not do is allow us to move forwards since the hand and forearm are now pushing down. When this happens the head and body come up and the legs sink leading to an uphill swim. One of the hardest things to perfect is a great catch position, many people get there but once the tired breathing starts we often revert to the straight arm push down. Last year I was filming a local tri club and the stats were amazing, only 2 from 40 were able to set this up correctly. The following is the shape we are looking for regardless of breathing or not. 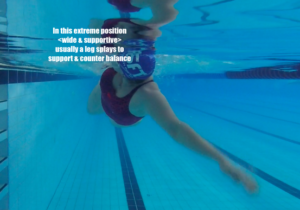 I work on this with the basic Torpedo Drill to reconnect the leg kick to the body and how it rotates. Learning to rotate without the arms involved is key. Adding a central snorkel can help as you reduce the head turning but this does not get to the heart of the problem. If you are not sure if you are setting your catch correctly regardless of breathing or not then the Thumbcatch drill can help. 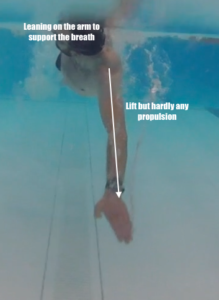 This will help create a vertical forearm position with the fingertips pointing down and the palm pushing water back rather than down. Quick fixes – paddles will not help this alone regardless of what is promised by the manufacturer. It is possible to push down with a straight arm whether there is a paddle attached or not, whether the hand is shaped in a fist or enclosed in a glove, bag or holding a dog toy. They might help you focus on the area that needs work but alone they will not encourage you to pivot at the elbow and set your catch. Large paddles might help you feel the upward movement but again will not tell you what the correct movement is. Learning to pull with the hand and forearm is essential to go forwards faster but we must first correct the body position issues first to avoid issues when breathing tired. 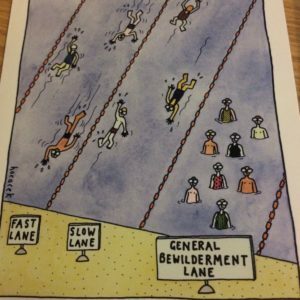 A light hearted look at swim coaching. So I breathe in when I turn my head to the side? ‘if you can do it any other way then you are moving onto the advanced course. Coaches are devious creatures, engaging all sorts of tricks to get you to try a little harder, swim a little faster or further. This will be of interest whether you swim or coach and will offer an insight into the coaching mentality and the pressure created by swimming in a group. When the two of these combine and work well, you will swim fast…. Many years ago Coach would offer us a get out swim. We would swim Mon-Fri, 5:30am to 7:30am with the club before school. As a reward we might be offered the chance to nominate one of the swimmers to step up, accept a swim challenge and possibly get out 15mins early if said challenge was met or time beaten. Many of our club records were set during these get out swims. The elation and joy of possibly leaving just 15mins early led us to discover depths of energy and strength previously not discovered enabling superhuman speeds. Often best times would be set that we struggled to beat in major competitions. With the others in the lanes watching and relying on you, the pressure built. With the chance to let everyone out early and shower longer, walk slower to school or eat more at breakfast it was a deadly serious business. Olympic trials qualifying times were made during these swims! it was a chance to perform and no matter how many 000s of meters just swum it did not matter. Fatigue was not an issue. Along similar lines I challenged out fitness swimmers with the following mainset knowing I would change the end option and see how they reacted. I am convinced that allowing swimmers to shape their own sessions encourages them to work harder. Or work appropriately to how they are feeling and yet find a way to dig deeper. repeat 2×100, 2×50, 3×100, 2×50, 4×100, 2×50. All were expecting it as i am quite predictable knowing how much I like a nice pattern! You can even see swimmers holding back on the 4×100 knowing what else is coming, you can see their pacing drop back a couple of seconds. Instead I offered a choice of the following after the 2×50 recovery. 6x 100 on 2:10, 5×100 on 2mins or 4x100m on 1:50. At this point the guys were pretty tired from the big block of work and I did not think the 1:50 option was likely. If it had been 3 some of them might have tried. Given the fatigue levels the 2:10 was my bet but once again I underestimated the power of group to get together, rally around and fight it out and not take the easiest option. 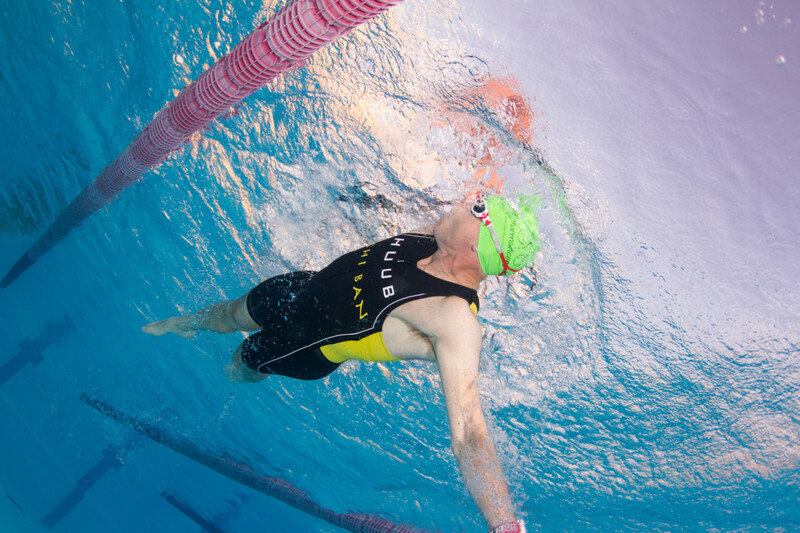 Often a mystery swim pops up to keep people guessing but this was a new challenge to let swimmers choose more distance with an easier interval, the predicted and expected set or a harder but shorter swim. From a coaching perspective always mix things up, offer alternates, allow the swimmers some input into their set. Chances are they will work harder and you will all benefit. This block of work is named the creeper as it starts easy and the exhaustion creeps in. You could also make it harder by reducing the rest interval as the 100s go up. You could also go back up and make the set 3.4km which is a big block of work and ideal for Ironman. 1×100, 2×100,3×100, 4×100, 5×100, 4×100, 3×100, 2×100, 1×100 with the 2×50 stretch out between 100m blocks. A group fitness session that is coached invariably gets you more excited to swim, to swim harder and faster. That is what we strive for within our sessions. The group cohesion comes together trying not let anyone get left behind. The camaraderie between the swimmers helps the group march forward into whatever I can throw at them. If you have not yet tried a fitness session with us come along and try it. Be prepared for devious methods to get you to try more and some enthusiastic peer pressure. So, this cold/head flu/chest infection thing dragged on for 3 weeks. For me that is unusual. Most years it is a one week of nose blowing and sneezing and then get back to it. If you are athletically inclined than being out of action is no fun. It is like the expenditure of energy through training creates more and leaves me buzzing. Similarly, the huge amount of effort needed to get out of bed early and get to the pool for an early swim leaves me amazingly wide awake and bouncing for the rest of the day. At least until 2pm perhaps. Is it real or is it just that smug sense of getting something done while others are asleep? maybe a bit of both. On the other side of the coin when I cannot train the fatigue grows, the general daily malaise festers and the negative thoughts of how much fitness I am losing compound. After a strong summer of openwater racing and events <60km plus of events raced> come September I thought I was in pretty good shape. Fri Sept 13th was my last swim session and it had gone well. We were two weeks out from the masters National shortcourse Champs and I had the 1500m entered. Sat 14th I had the scratchy back of throat sensation and had started sneezing. At this point I was ok about it since for as long as I could remember I was a one week ‘cold’ person that was easily shrugged off. 7, then 10days came and still I was not right and certainly not able to swim. The following was useful from my recent SCIENCE OF ENDURANCE TRAINING AND PERFORMANCE course from the Uni of Kent. I don’t think this was written with swimming in mind though and you need to think carefully about what might be feasible, what might be actually useful and what will hinder your all important recovery. The Road back to Recovery –This brief guide is based on the article by Ronsen (2005). Day 1 -NO strenuous exercise (very light exercise (e.g. heart rate less than 120 bpm) is OK if only above the neck symptoms (e.g. sore throat, runny nose) present. NO exercise at all if symptoms are ‘below the neck’ (e.g. muscle/joint pain, headache, fever, generalised malaise)…. Remember, exercising with an infection can be very dangerous!! Day 3 – If symptoms persist, consult doctor. If no fever or malaise and no worsening of initial symptoms: moderate exercise (e.g. heart rate below 150bpm) for 45 minutes is OK. Ensure you have had at least one day without fever and other symptoms before returning. Ensure full recovery for each session before undertaking the next session (you will probably take longer to recover than before the illness). Stop exercise and consult your doctor if: New episode or worsening of initial symptoms, or if fever develops. Persistent coughing and breathing problems in response to exercise. Gradually increase back to normal training (taking at least the same number of days spent off due to illness before getting back to ‘normal’ training levels). Pay particular attention to your tolerance to increased exercise intensity and take an extra day off if it feels harder than usual. Swimming well is a highly cognitive activity and if you are distracted with a foggy head, struggling to breathe, coughing and spluttering I wonder how much you are really helping yourself. You probably are not helping your swim advance in any way and it is unlikely to be assisting your recovery. Maybe some head up kicking with a float to ease the strain on your breathing if you are only suffering ‘above the neck symptoms.’ Sculling could work well at this point. This will keep you in touch with the water and reduce that clumsy mechanical feel when you finally do resume full training. 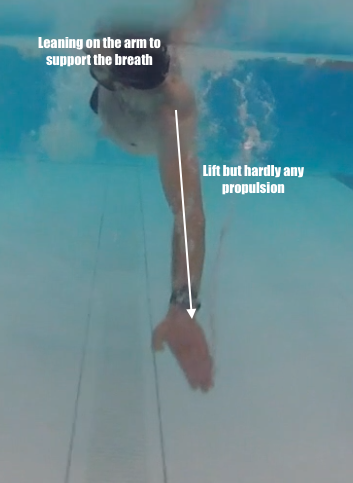 I usually refer back to my Christmas example and how swimmers after 10-14 days out of the water despite feeling mechanically dreadful in the water they are not as bad as they think they are, once we have reassured them with video footage. Don’t rush back. You are not going to lose the full mechanics of your swim stroke in 2-3 weeks. Each day you try to rush back to reduce your fading fitness inevitably you delay your full recovery which only further lengthens the longer project of getting back to full training. I would not swim with ‘below the neck’ symptoms as described in Day 1 and to be honest I doubt you could do much to enhance any area of your swim even if ‘only’ suffering with above the neck symptoms. Day2 – if no fever or malaise present then perhaps you could work on some yoga or prehab exercises to keep the body supple. 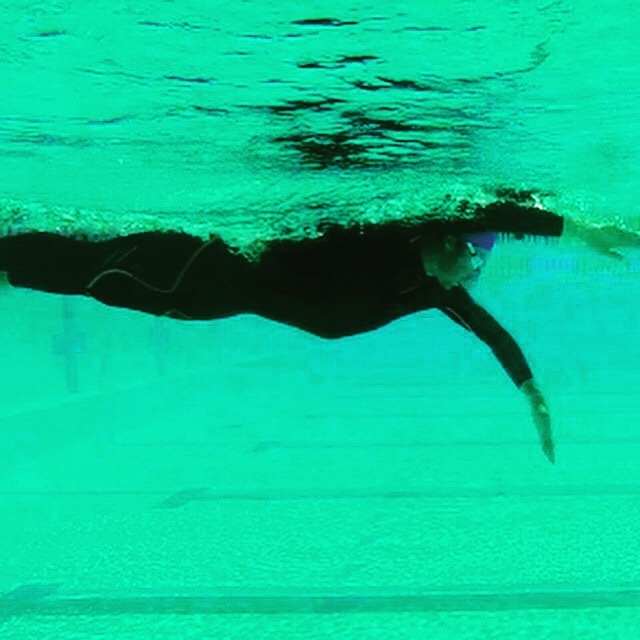 Stretchcordz are a possibility which will have you reproduce the swimming arm actions but allow the HR to stay low and not restrict the breathing in anyway. Day3 – if no fever or malaise then 30mins gentle full stoke made easier with a pullbuoy and snorkel to keep the heart rate down and the airways flowing with no restrictions. Providing you were already comfortable with a snorkel in the first place. Day4 – if feeling ok then start the Post illness return to training as described above. As I went through this process as much as I wanted it to be over and for me to be healthy I had to stop myself training. Going in too soon was not going to get me fitter or stronger. I could have practiced some drills but I wonder how accurate they might have been and surely I could be accelerating my recovery with the extra time resting and sleeping. Activities for long term time out of the water. Watch some swim videos. You can study and learn. Be inspired to return to the water. Competition admin! start to enter those races. Many are opening and filling. Henley just announced the date of the 14km swim. Order some new kit to replace old/tired/not shiny. An eventual return to the pool with new kit will help. Take as many positives to that first session as you can. At the least rinse and shine those tired goggles. Rose tinted?! Start an online diary/training plan/commit and get accountable, plan to swim x metres each week and hold yourself to it. The Speedo On app and website are very easy to make use of. Revaluate your nutrition and diet. Is there anything you can do better to avoid such incidents in the future? Do you carry hand gel? combined with more hand washing <soap and water> this can help as long as it is over 60% alcohol. Read up on some of the great Tri books out there. Especially mine and Steves! Maybe this is the time to finally plan that training camp you had been promising yourself for quite some time. Rest and get your sleep. I once read that you need 7 days to get over a cold with antibiotics or 1 week without. If you catch something then let it run its course. Make the time productive in other areas. I actually got some of my Xmas shopping done last week thinking I would then be free to train in the run up to xmas! Let us see how that one works out.